If yesterday’s weather was “very good,” we learned from the met man this morning that it would be “very complicated” today. He told us that we would probably want to be back on the ground by 1500, ahead of a fast-moving cold front coming up from the southwest. The word “hail” was mentioned. The rest of the forecast described good soaring conditions ahead of the show-stopping front. The Task Setter gave us a pair of short, identical triangles to the north, and the Director set the time of first launch at 1100. This sounded reasonable at the time, and it seemed plausible that we would be able to follow the meteorologist’s recommendation to be back in the trailers by 3pm. Unfortunately, that’s not how it turned out. 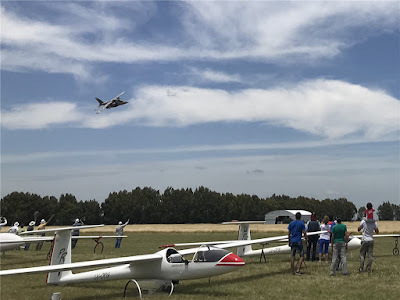 They tried to distract us with a flyby of an IA-63 Pampa, but you could tell that the pilots were looking mostly at the sky and their watches, and not so much at the jet. 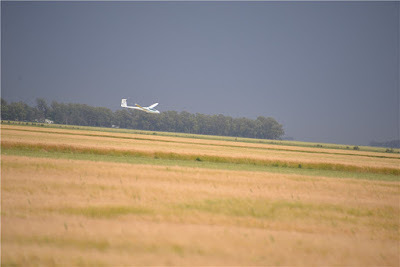 Finally, at 1219, the Director started the launch, to the surprise of the pilots and crews. Everyone left as soon as the gate was open, from an altitude of about 1700 meters. It seemed like a hopeless mission. 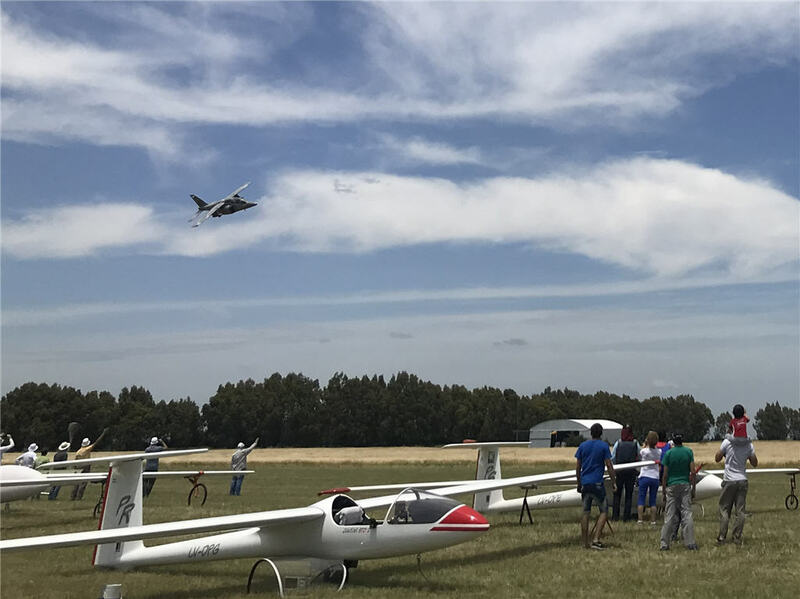 At 1430, when the pilots were arriving at the first turnpoint (53 km upwind from home), the Team Captains were summoned to a special weather briefing. We learned that the arrival time of the front had been moved back to 1600 (good), but its associated weather had been downgraded to “dangerous” (not so good). They mentioned hail again. They also gave us permission to move the trailers out on the taxiways to expedite disassembly, and they waived the flight documentation interval. I calculated that the fast guys would make it home ahead of the front, maybe. But, you know, maybe not. We were still in communication with the team, and after describing the situation to the pilots and consulting with John, I decided to give the guys the option of abandoning the Task. Robin, Ryszard, and Al elected to turn around and come home. It wasn’t clear what the other three intended to do because that was the time that the tree fell on us and took out our base station radio. 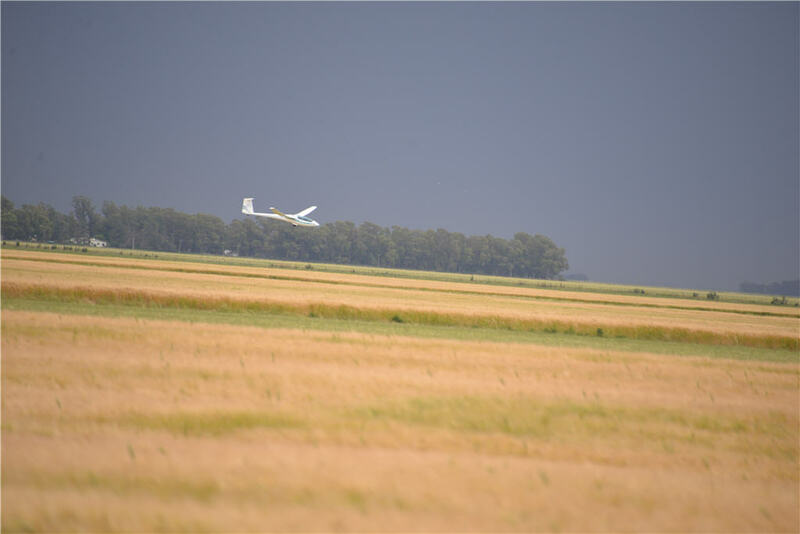 There was nothing left to do but walk out on the taxiway and watch gliders landing into a very strong wind and against an ever-darkening backdrop. Fernando arrived first, followed by Juan and Phil. They had completed the task, with just minutes to spare. It was dry when they landed, but the ensuing downpour sent everyone running for shelter.